Design Burd Inc.Bermuda, Bahama, Come on pretty….. Actually, St. Barts is where you want to be… | Design Burd Inc.
Â Villa VBB is a beautiful and luxurious 4-bedroom villa located high on a hillside in Colombier, St Barts so creating a site that looking nothing less that amazing was pretty easy. The site features a beautiful array of photos of the villa, detailing each room and allowing users to make reservations. 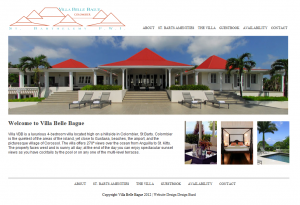 Overall the site gives you a tour of the Villa and Amenities while providing the visitors with a simple way to make reservations forÂ theirÂ friends and family. Visit the site and better yet visit St. Barts!